One of the things I knitted for Christmas, was a gift for my niece. My SIL had commented on how quickly little E was growing out of things, especially the cardigan given to her when she was born. So of course I decided another cardigan was in order, in time for Christmas. 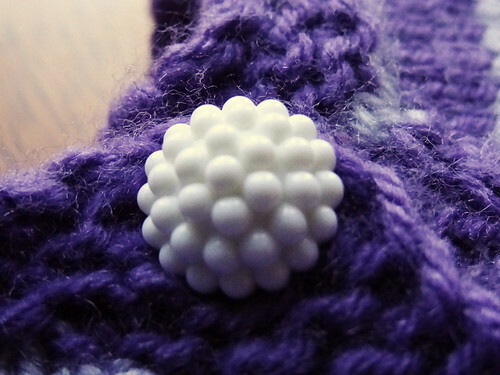 I had favourited on Ravelry a gorgeous cardigan pattern. It was a free one, but sadly it was for newborns. Looking at this pattern led me to discover a re-visited version that ranged from newborn to 2 years old. It was a paid pattern but it was an incredible bargain in my view. Beyond Puerperium by Kelly Brooker is $5/£3.19 and for that price you get 7 sizes in 3 different weights of yarn. In my mind, that is a complete bargain, and it will probably get made over and over again, especially when you consider how cute it is! Isn't she adorable? Yes, she is even cuter in person. I know I'm biased, but apparently complete strangers come up to my brother and SIL in the street and tell them she is cute too, so I think it must be true. I made the 6-12 month size of cardigan. She is just over 6 months old now and it seems to fit her well, but has plenty of room to grow into. 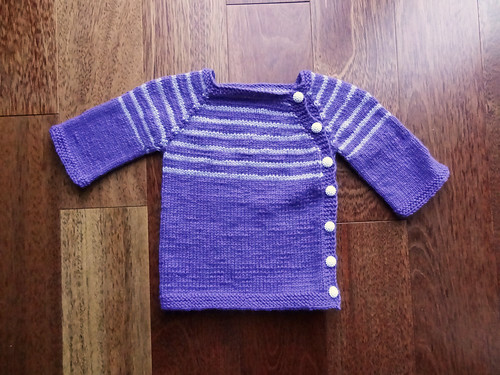 Apparently, more cardigans in bright colours are just what my niece's wardrobe requires, so I think I'm going to get plenty of use out of this pattern. Here's a picture of the cardigan lying flat so you can see how it works. I used Sirdar Snuggly DK in colour 197 for the main body of the cardigan. 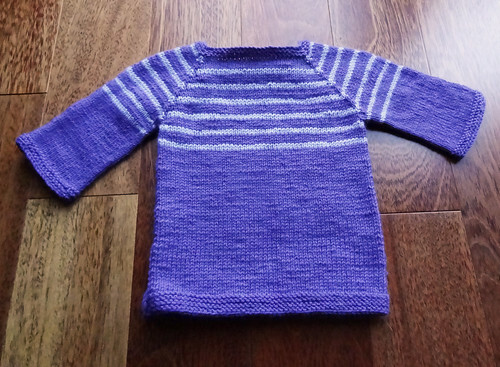 The lighter purple stripes are made using Rico Design Baby Classic DK in colour 9715 (Elieder) which was left over from the Wee Hat I made in November. I learnt how to do intarsia, set into a row like this, whilst doing the Spectra scarf, and it works really well. In this case, it means the change in colour isn't on the open edge of the cardigan, but set inside the main body of the knitted fabric. I think it makes things neater. I love the little details in this pattern. It's deceptively simple, but the garter stitch edges on the cuffs, neck and hem add contrast. The neck is nice and wide, so it doesn't pull or rub against the baby no matter how active she is. The buttons fasten nearly on the side seam, which means the buttons don't dig in when the baby is on her stomach. Because I knew the buttons were going to be tucked away, I chose some fun ones. I'm so pleased with this project. I think it is pretty and very wearable for an active baby and whoever dresses her in it! 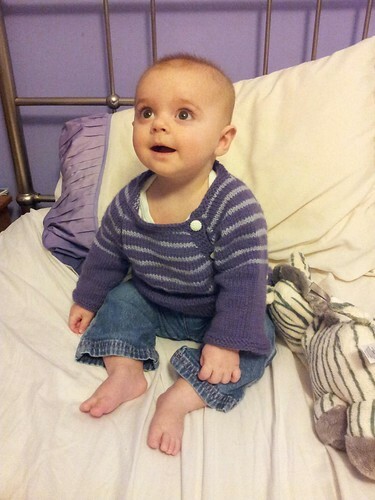 Thank you to my dear SIL, Emma, who let me use the photo of my niece in her cardigan. It's a wonderful photo which not only shows off her wardrobe, but also how engaging my niece is too. I am going to have so much fun knitting for my niece over the coming years. I'm so lucky to have family who enjoy and use my handcrafted gifts.